Collaborative robots pioneer Universal Robots unveiled at Automatica 2018 its e-Series cobot arms, the next generation of its flagship line. The company says the UR3e, UR5e, and UR10e offer more precision and sensitivity, enabling a wider range of applications, faster set up times and new safety features. Universal Robots, which has seen strong growth in Asia, is already taking orders on its new e-Series cobots. The cobots will start shipping to customers on August 1, 2018. A Universal Robots spokesperson in booth B4.303 at Automatica says the older cobot arms will continue to be sold. 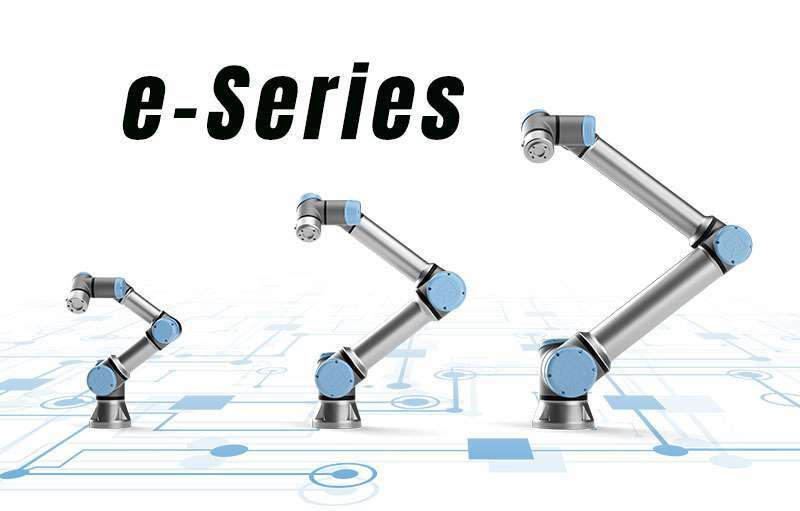 Here’s a quick breakdown of the new Universal Robots e-Series. The repeatability of +/- 0.03mm is a significant increase over the +/- 0.1mm of the UR3, UR5 and UR10. For a more detailed comparison, check out the last page of this e-Series document. Universal Robots claims the e-Series can be unboxed and set up for its first task in a new environment in one hour. It also says the joints on the e-Series cobots can be replaced in 2-6 minutes. Wrist tool I/O connectors and a high speed communication bus enable easy integration with UR+ products. Universal has also redesigned the base of the robots, tucking the wiring neatly out of sight. The Universal Robots e-Series is certified by TÜV Nord, and all these functions are in compliance with the EN ISO 13849-1 and EN ISO 10218-1 (Cat. 3 PLd) machinery safety standards for unobstructed human-robot collaboration. To simplify robot programming, the Universal Robots e-Series features a modernized the teach panel and touch screen, redesigned the interface and made it more intuitive, especially to facilitate the programming of complex processes. Universal Robots booth at Automatica 2018. The company’s UR+ family of third-party accessories will be compatible with the new e-Series. Robotiq CEO Sam Bouchard, for example, says Robotiq’s new Hand-E adaptive gripper (we’ll have more on Hand-E soon) will be ready for Universal Robots e-Series initial shipments on August 1. Bouchard says he found out about the e-Series about one week ago, but insists the Hand-E gripper carries the “E” moniker coincidentally. OK, Sam. Sure! Universal Robots co-founder Esben Østergaard and Gudrun Litzenberger, General Secretary of the International Federation of Robotics (IFR), were named the recipients of the 2018 Engelberger Robotics Award. The Robotic Industries Association (RIA) will be honoring them both tonight at the Engelberger Awards Dinner and Ceremony at Automatica.